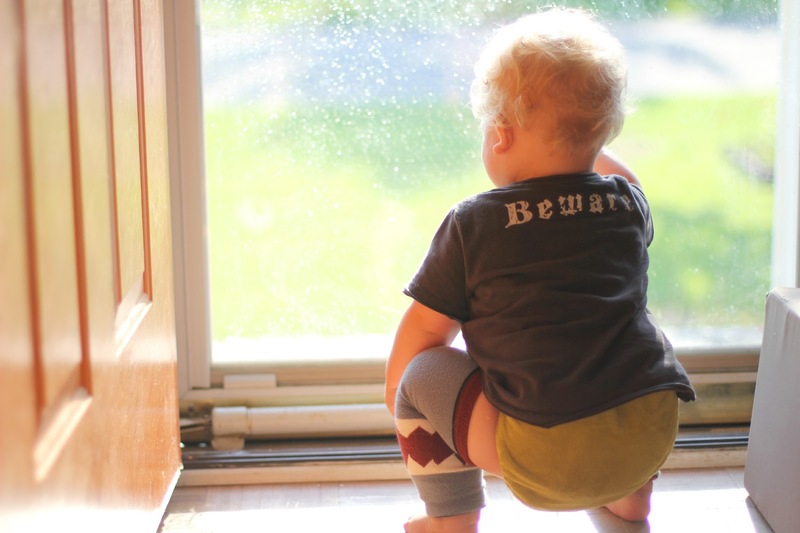 Ok, it has been WAY TOO LONG since my first post about cloth diapering, and I HUGELY apologize for that. Life has been crazy this past month and a half, and as I have mentioned in previous posts, other things just got in the way. BUT, I am finishing this first series, and am already working on another one for different types of cloth diapers. For convenience, I bumped up the previous post with a couple of updates. You can find it linked below. Part one of this two-parter discussed why we cloth diaper and what brands we used/why we liked them. Please feel free to check out that post if you are reading this one first, although they don't necessarily need to be read in a specific order. For this one, I want to focus on how we wash them, the system we use, and night time diapers. One of the great environmental factors to cloth diapering is that they aren't taking up landfill space. You're not tossing them out and you're helping in keeping our planet just a little greener. Unfortunately, this means that you need to clean them yourself. I promise you, this is not NEARLY as scary as some people think. What you have to understand about cloth diapers is that they are most efficient when they do not have any build-up on them. Build up can occur through a number of things, including the type of detergent you use, whether or not it has dyes or fragrances, how MUCH you use, how you wash your diapers, fabric softener, etc. They are not like normal disposable diapers, where they are filled with chemicals to help catch urine. If you have build-up on your diapers, then that build-up will repel the urine. That's when leaks happen. Leaks are bad. 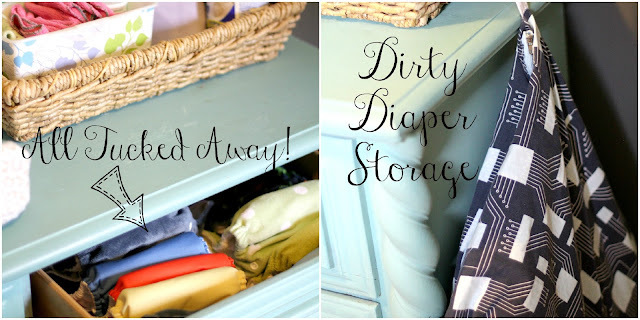 I wanted to mention how we store our diapers, both clean & dirty. This isn't hugely important, and it's definitely key to do what works best for you. But I am totally that person who researched the best way to store diapers. I am very weird in the fact that I MUST know how other people do it before I figure out how to do it on my own. It's probably some sort of personality flaw or self-esteem issue, but I was that person who googled the best way to store your diapers. And of course, what I found [no surprise here] was that everybody essentially does it differently. Storing them clean isn't really a big deal, but there are different ways to store your dirty ones. This is just one way, and I'll mention another, but again, do what works for you. 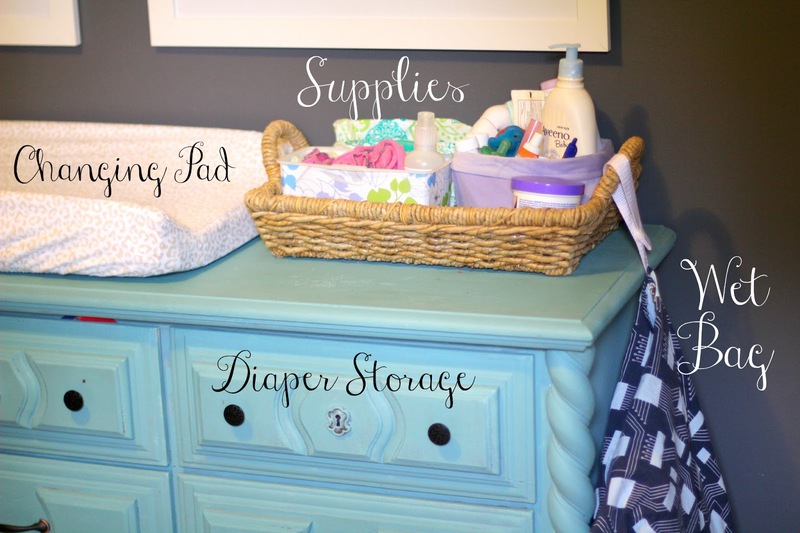 Our clean diapers simply go into a drawer in the nursery dresser, which also serves as our changing station. After they are clean/dried, I stuff them & place them in the drawer. This way they are ready to go for me, M or whoever else may be changing a diaper. Some people stuff as they go. That's fine, too. I just like to get it all done. Also, I love seeing a drawer full of bright, pretty cloth diapers. I know. Weirdo. When they are dirty, in our house, we use a wet bag system. This means that when we change diapers, the dirty diaper & the reusable wipe go straight into the bag & said bag is zipped up. I keep this hanging on the side dresser and every day we start a new one. A true wet bag will KEEP THE SMELL IN. I promise. We do not have any odor issues, no matter how nasty a diaper is. Other people use a wet bucket. This is simply a large bucket that you keep full of water, and as you change a diaper, you throw the dirty diaper in the bucket to soak it before washing. Your call. BUT WHAT ABOUT THE POOP?? This, I think, is what is most terrifying for a lot of people looking into cloth diapering. OH GOD ... the POOP! Yeah. Poop is gross. We all know that. But, it happens, and you have to deal with it. There are a lot of ways to do this. You can buy a diaper sprayer, that you hook up to your toilet & you simply spray the poop away. You can do what we did and grab an old spatula that you're not emotionally invested in and use that to scrape it into the toilet (We keep clorox wipes with it to clean it it off after each use). We also use liners. We don't use them with every diaper, but Lucas has gotten pretty dependable in his "timing." Liners are great because you simply dump it all into the toilet & flush, liner included, and it saves you the effort of having to scrape it off. It's totally your call on how you want to handle it. Your washing machine is set up to handle a lot of dirt. It can handle a lot of poop, too. Trust me on this one. We have the cheapest washing machine on the planet, and we have had no issues whatsoever. Rinse Cycle: Every three days, I pull all the diapers apart (pulling the liner out of the pocket) and throw into the washing machine. I also turn the wet bags inside out and throw them in there as well, and toss in any reusable wipes that were used. I then run a COLD rinse cycle, with NO detergent on a full load setting, even if I am not washing a full load of diapers. This is a crucial step, because what this is doing is giving your diapers a good rinse. It is rinsing away most of the urine and most of the poop. You want to do it on cold, because hot water will set any stains that you have, which you do not want. You want those diapers coming out white and fluffy! Also, WATER IS YOUR FRIEND. The more water you have in there, the better. If your diapers are a little dirtier than normal, let them soak for an hour once the rinse cycle is full, then run the rinse cycle. This will help loosen up any "mess" that may be tricky to get out. Wash Cycle: After I do the rinse cycle, I set it to a Hot/Cold setting and do a long wash cycle WITH the extra rinse cycle turned on (so it will get two rinses after the wash). I throw in 1 1/2 tablespoons of Rockin' Green and call it good. This washes the diapers on HOT, then rinses in cold twice. You don't need a lot of detergent. Too much detergent will cause build up on your diapers, which will then cause leakage. Leaks are bad, remember? Drying: There are two ways to dry your diapers. You can throw them in the dryer, and set it to low. This is the quick way to do it, and as a full-time working mom, the way that we do it most often. Sunning your diapers is actually the best way to dry, however, and this is how I dry my diapers on the weekends. Sunning simply means laying your diapers and inserts on a rack in the sun, and letting the sun do the work. This helps prolong the life of your diapers and again, you're not wasting energy. Also, if you have any stains on your diaper, a little sun is the best way to get rid of it, believe it or not. We have been cloth diapering for over a year now, and all of our diapers look as white & clean as the day we purchased them. If you take care of them properly, they will last you the life of your child being in diapers. I mentioned that we use reusable wipes. This is not a 100% of the time thing. BUT, if it is just a wet diaper, I will use some cut up fabric (Fleece works best! Cotton is also great. Baby wash clothes you can buy at the store? Perfect!) & some cleaning spray. My personal favorite is California Baby Diaper Area Spray. I tried a couple home made diaper sprays and they were just too harsh for Lucas's little bum. California Baby is very sensitive and we have not had a problem with it since we started using it. You can also use just plain water (in fact, when my bottle of spray was half empty, I topped it off with some water and called it good). We DO use disposable wipes for the bigger, messier, dirty diapers. But that's just us. I know some who ONLY use reusable wipes. I also know some who ONLY use disposable wipes. Again, this is one of those areas that is up to you. What Happens If We Have Leaks? If you have a leaks, there are a couple of things that could come into play here. One, that diaper may not be tight enough. Or it may not fit correctly. If you can get those snaps a little tighter, do it. Check to see how much room is in the legs. Is there too much? The diaper might not be a good fit for your baby and maybe trying a different brand is in order. But what if the diaper fits perfectly and you're still having leaks? I've mentioned buildup before -- any sort of chemical buildup on the diaper will results in said diaper repelling liquid, which we don't want. There is a very simple solution, and it involves "stripping" your diapers. I use a product called RLR if we ever have a problem. 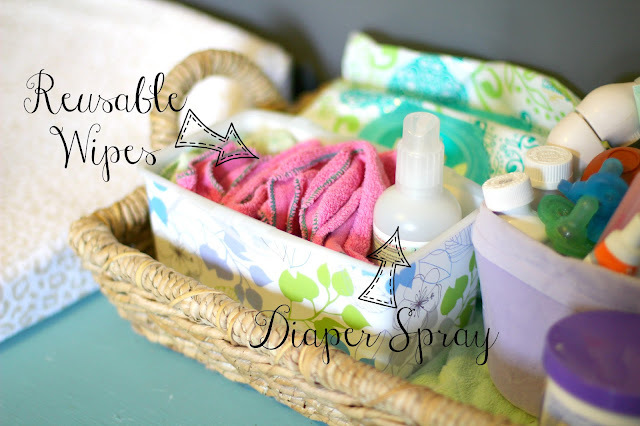 I wash the diapers as usual, then run an extra wash/double rinse cycle (without drying!) with one packet of this. This helps get the diapers whiter and removes any residual buildup that can come from using detergent, diaper rash cream, etc. One load like this usually solves any problems we have. This post has gotten much longer than I wanted it to be, BUT, this is the last section. I promise. Night time diapers, I will admit, have been an issue for us. From early on, Lucas was a very heavy wetter, and even when we triple stuffed diapers, he would leak right through at night. And not just a little - he would SOAK through the diaper. It wasn't fair to him to wake up every morning completely wet, and it was frustrating to me to have to keep doing so much extra laundry. We tried probably six or seven different type of diapers that were supposed to be good for "heavy wetters" and Lucas blew them all out of the water. So, I will admit, that we use disposables at night because it truly was the only thing that worked for us. With Lucas being older now, I am thinking about trying cloth diapers at night again, because his out put doesn't seem to be as much at night as it used to be. I wish I could be more of an "expert" on night time use, but I don't have any advice to give, other than to keep trying to find one that works for, and if you can't, there's no shame in using a disposable. That's still only seven diapers a week, instead of however many you would use if you were using full-time. PHEW. That's a lot of information in a couple of posts!! I'm working on a post on the different type of cloth diapers, and will have that up in the next couple of weeks, so be on the lookout. And if you have any questions, please feel free to ask or contact me! This is a fabulous summary of the process. Great resource to send people to when people ask me about cloth diapering!! Thanks! You mentioned your cheap washing machine, so I wanted to weigh in. The cheaper the washing machine, the better for cloth diapers!! What makes them cheap is that they 1) take a lot of water and 2) agitate the hell out of your wash. But those are good for getting cloth diapers clean! I actually struggle with getting mine clean using a higher-end front-loader. Sometimes I wish I had another one - a cheap one - to do the job. Good point, Lauren! Yes! My little washer is an agitating machine! We have talked about buying a nicer/newer machine, but I have no complaints with my current one & I worry about how clean a new one will do! I don't think we will ever get a front loader until cloth diapers are out of our lives!